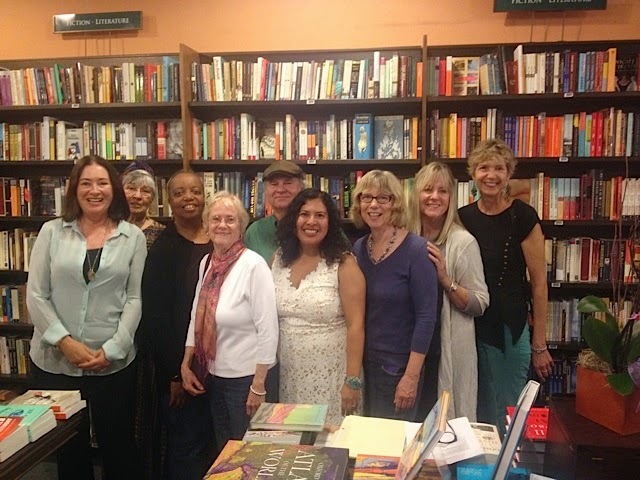 Earlier this National Poetry Month, the city of Santa Barbara named its sixth Poet Laureate, Sojourner Kincaid Rolle. A historic and long overdue nomination, it was such a joy for all who know of her hard work as a poet and community activist to see her crowned the city's official Poet Laureate on April 7. 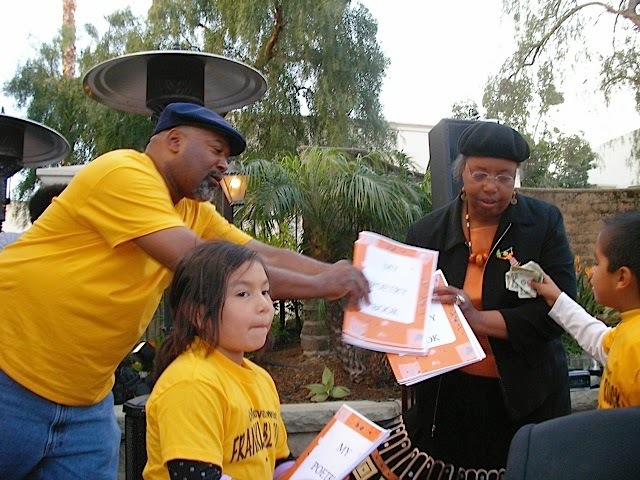 When Santa Barbara Mayor Helene Schneider called Sojourner to tell her the good news, Sojourner assumed that the mayor wanted to discuss a ballot initiative. Sojourner says it took her several hours to recover from the rush of adrenaline upon hearing the great news. 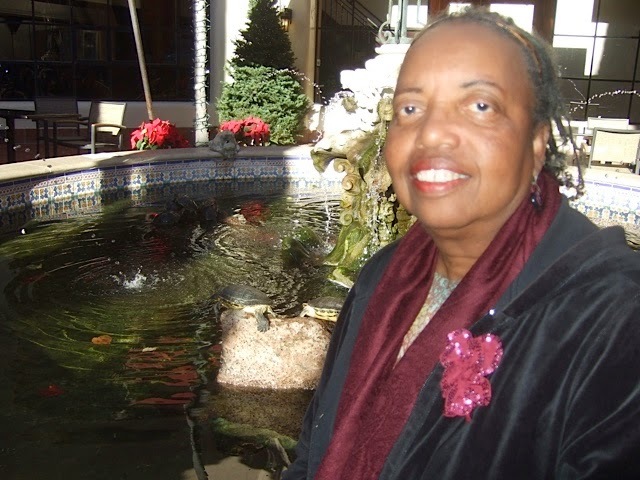 I've known Sojourner for almost 15 years and she had always been labeled unofficially, "The People's Poet." As her friend and poetry colleague (we are both members of the Sunday Poets), I was especially proud to hear of her appointment. In her previous occupation, Sojourner graduated from UC Berkeley's School of Law. Although she is not a lawyer, she remains a mediator, activist, and peace maker. Lucky for the community, she has returned to the occupation that occupies her heart, Poet. Sojourner helping student poets sell their handmade poetry books. Since the tender age of five, when she moved to North Carolina to live with her grandmother, her grandmother thrusted her onto the public stage by teaching her to memorize several poems and one day encouraging her to enter a talent show by reciting a poem. From that day, other students asked Sojourner to visit their class and recite her poem. Thus her career, as guest artist began at age 5 in North Carolina, after Sojourner spent an entire day visiting all the classrooms in a North Carolina school house for grades K-12 reciting her impressive performance. Now Sojourner recites and reads her own poems. As a poet-in-the-school, visiting poet and guest speaker, Sojourner teaches young students how to write poems and read them out loud. She says she espouses the "stand and deliver" technique and gives young students the opportunity to write poems and deliver them in public. She also teaches poetry workshops for adults and has taught several college level courses in the Department of Black Studies at UC Santa Barbara, and is affiliated with the Center for Black Studies Research UCSB, which published her most recent poetry collection, Black Street. Sojourner's energy and dedication to the community over the past 30 years is boundless. She is a poet, author of seven books, playwright, environmental educator, and activist. She is instrumental in the yearly tributes to Dr. Martin Luther King, Cesar Chavez, and Langston Hughes, to name a few. Her recent books are Black Street and the Mellow Yellow Global Umbrella, an electronic and audio book showcasing poems for young people. Over the next two years, Sojourner Kincaid Rolle joins past esteemed poets laureate Barry Spacks, David Starkey, Perie Longo, Paul Willis, and Chryss Yost. Saturday, April 25 Sojourner Kincaid Rolle joins the Santa Barbara Poetry Series, Saturday at 7 p.m. at Kerrwood Hall at Westmont College. The program includes Caitlyn Curran, Christine Penko, SK Rolle, together with the Westmont Chamber Singers under the direction of Grey Brothers.